Is it worth the effort for an Environmental Protection Agency administrator in a Democratic administration to meet with her farm, ranch, and Republican critics? Or should she stay safely among her environmental and conservation supporters in Washington and the coastal cities and just push ahead? 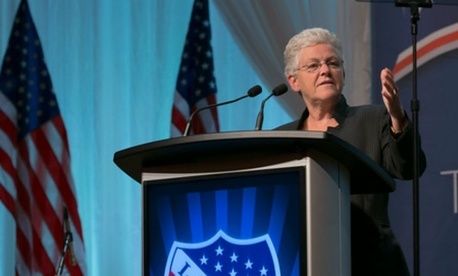 EPA Administrator Gina McCarthy, who is under fire in rural America for a "Waters of the United States" rule that EPA and the Army Corps of Engineers proposed in April, has been making the effort, with a trip to Missouri early in July and a meeting last week with Republicans on the Senate Agriculture Committee who have been asking for a sit-down since May. The outreach hasn't stopped the criticism, but McCarthy told me in an interview Thursday that she feels the effort has been worth it. McCarthy said the trip to Missouri was "a signal that this rule is very important to EPA." On Capitol Hill she said she learned that "EPA speaks with a lot of technical language and science. It is not readily translated into what is clear on the ground for the farm community." WOTUS, as the rule is being called in environmental and agricultural circles, would define the scope of waters protected under the 1972 Clean Water Act following two Supreme Court decisions that said the feds had to come up with a more scientific basis for deciding what water bodies come under their jurisdiction. The point of the rule is to make sure that the nation's drinking water is safe from discharges of pollution. The biggest point of contention is a provision that says EPA and the Army Corps would be allowed to decide on a case-by-case basis whether to regulate wetlands and other waters that are not directly connected to running streams and rivers but have "a significant nexus to a traditional navigable water, interstate water, or the territorial seas." Farm and ranch leaders who examined the rule immediately said they feared the provision could require them to obtain government permits for activities in which they have long engaged as a regular part of their businesses—and that because the determinations will be made on a case-by-case basis, the proposal creates a great deal of uncertainty about their future operations. EPA also issued an "interpretative rule" that tried to define farm practices that would be exempt from regulation, but that only made farmers think about what practices were not included and worry they would come under regulation. The ensuing battle can be summed up in one word: ditches. Farmers and ranchers say EPA wants to regulate all their ditches that may fill up with water at some point during the year. The Republican-leaning American Farm Bureau Federation has called on McCarthy to "ditch the rule." On the trip to a farm in Missouri and in a speech to the Kansas City Agribusiness Council, McCarthy said she wanted to "ditch the myths" about the rule, but her critics weren't satisfied. The farm federation reacted to her Missouri trip by sending Congress a document "decoding" point-by-point an EPA blog post that attempted to explain the rule. The Republican senators she met with issued a series of news releases saying they appreciated her visit but EPA should still withdraw the rule. Bills have been introduced in Congress to require EPA to withdraw the rule, but they are unlikely to go anywhere, at least as long as Democrats control the Senate and President Obama backs the rule. In any case EPA and the Army Corps are under pressure from the courts to define their jurisdiction. That means EPA is likely to proceed with the rule, although McCarthy said she won't finish it until next year after her staff has analyzed all the comments due by October and received a study from a scientific advisory panel. In the meantime, McCarthy could work a bit on her own communication skills in rural America. EPA administrators tend not to come from the heartland, and McCarthy is no exception. A Boston native, McCarthy speaks with a strong New England accent and she seems not to suffer fools gladly. In a telephone news conference before she left for Missouri, McCarthy said: "We're hearing some concerns that are just ludicrous.… Some say EPA will regulate small, unconnected waters ... including puddles on lawns, driveways, and playgrounds. That's just silly. This proposal is all about protecting waters that science tells us have a significant impact to downstream water quality. No more, no less." And she concluded, "Some say that our proposal means you need a permit to walk cattle across a stream. That's not true. If cattle cross a wet field or stream, that's a 'normal farming practice.' All normal farming practices are exempt, period. We don't shrink current exemptions—we expand them." McCarthy's use of "ludicrous" and "silly" were not off the cuff, but included in the prepared remarks that her office later distributed to reporters. The words created more fodder for critics such as Sen. Pat Roberts, R-Kan., who said in a post-meeting news release, "Farmers and ranchers had hoped they would be able to persuade you to recognize the far reaching and negative impacts of the proposed and interpretive rules, but the reports back have not been positive. To hear that their concerns were categorized as 'silly' or 'ludicrous' is truly frustrating." In the interview, McCarthy said that she regretted only that people did not understand the context and that she used the terms "ludicrous" and "silly" to refer to statements mischaracterizing the rule that did not come from farmers and ranchers. "I want to make sure the agriculture community and every farmer realizes we take this really seriously. We need to focus on serious issues," she said. The strongest signal that McCarthy and EPA still have some explaining to do is that after McCarthy held a telephone conversation with the board of the Democratic-leaning National Farmers Union, the group signaled it was not satisfied by sending McCarthy a letter with eight questions it wants answered. McCarthy said that she will answer the questions raised by both the farm bureau and the farmers union as soon as possible rather than wait for the formal comment period to end in October. "We need to answer those questions as we go along," she said, noting that EPA has also updated its webpage on WOTUS to make it easier to understand. McCarthy does have her rural defenders. The Theodore Roosevelt Conservation Partnership, which includes a wide range of hunting and fishing groups, has said Congress should not interfere with the comment process and that fish, wildlife, and people all need clean water. The rule can be written so that "farmers and ranchers can farm the way they have and we can protect the waters," McCarthy said. But rural America will have to accept the fact that some ditches will be regulated. "We are talking about ditches that used to be streams and still act like streams. They may not have water running, but still act as a stream," McCarthy said. Then she added, "I never expected to say the word 'ditch' this many times in my entire life and I hope to get away from that as soon as possible."